The Wye Valley Walk is not difficult or challenging for much of its length, and there are many sections that can be enjoyed by people who are less mobile. The Wye Valley Walk Partnership, who manage the route, is working to reduce the number of stiles on the walk. 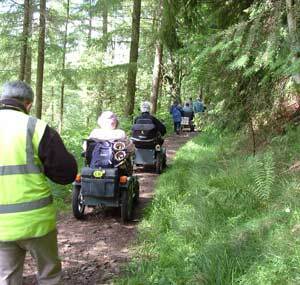 We have selected 24 Easy Access walks and sites, both on the Wye Valley Walk and close to it. Click on Easy Access Walks pdfs on right for detailed descriptions of each walk. Many of these are short strolls with access to facilities such as refreshments and seating areas. None have steep hills or stiles to climb, so are suitable for a range of people. All of the walks have been selected as they offer a taste of the Wye Valley Walk in interesting, easy to reach places with a pleasant riverside aspect. 3.2miles (5.2km) Pavements, riverbank paths, field edge paths, road verge into Llowes. Fairly flat but uneven path surfaces, a few steps. Official Route Guide map points 47 to 49 and into Llowes on road verge. Glasbury SO 179 393 via Boughrood to Llanstephan Bridge SO 113 417 7.6 miles (12.19km) Farm tracks, field paths, road, a few steps. 8.75 miles (14km) Road, open hill, stoney green lane, park, riverside paths. More undulating section of walk from Erwood Bridge to Builth Wells. 20 miles (32km) Green lanes, road, stoney track, exciting suspension bridge, nature reserve. Undulating route with many different surfaces. 2.68 miles (4.3km) Open field, track and road, quite hilly. 9 miles (14.5 km) Open fields, forestry tracks, farm tracks, forestry trails. Undulating section. Official Route Guide map points 86 to the end!